Design By Humans announces massive holiday sales and introduction of bonus Tee Grinder 2.0! This season, holiday shoppers can purchase something for everyone on their list with outstanding graphic apparel at Design By Humans (DBH). 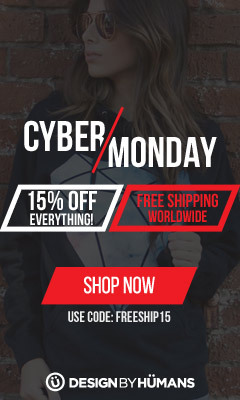 From November 26, 2014 - December 3, 2014, DBH is offering customers 15% off t-shirts, sweatshirts, hoodies, phone cases and more plus free shipping worldwide on apparel orders in their holiday Cyber Monday sale. This apparel sale will not apply to Tee Grinder 2.0!, charity tees, or previous orders. In addition to this ongoing sale, Design By Humans also has an exclusive special featured in their brand new Tee Grinder 2.0 on Friday the 28th! Design By Humans has revamped their famous Tee Grinder to include DBH Collective designs, giving customers even more choices when they grind. The Tee Grinder 2.0! allows users to choose their gender and t-shirt size, and then presents them with three random t-shirts for a reduced price. Users can grind an unlimited numbers of times to see thousands of different t-shirt combinations until they find the perfect one. 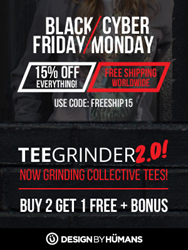 In an exclusive Black Friday sale, customers will receive a special deal in the Tee Grinder 2.0! 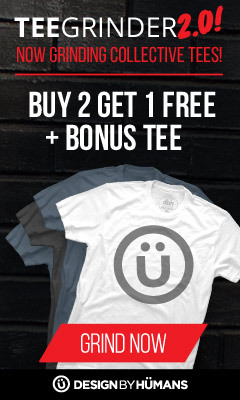 - Buy 2 t-shirts, get 1 free plus every Tee Grinder order receives a complimentary DBH logo t-shirt. 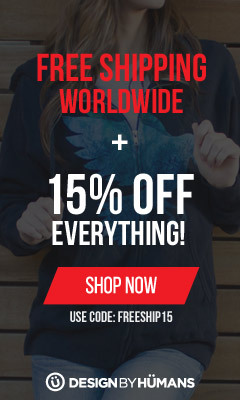 Design By Humans offers their customers and artists a large selection of high-quality products. 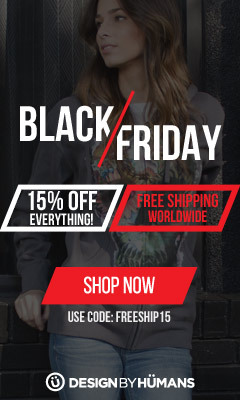 With the addition of new products, sizes and colors to their already outstanding product line, DBH has created a unique opportunity for their customers to create amazing, custom DBH apparel that fits and illustrates their own unique lifestyle. With over 25,000 designs available and a wide selection of colors, each customer has an almost endless selection of one-of-a-kind products: T-shirts, Sweatshirts, Hoodies, Tank Tops, Phone Cases and Glicee Art Prints. Design By Humans also strives to offer their customers and artists a wide variety of customizable apparel and products using the most efficient, vibrant, and eco-friendly DTG printing practices. All graphic apparel from Design By Humans has been garment-dyed and washed for exceptionally vibrant prints, premium softness, and minimal shrinkage. All graphic apparel will also continue to uphold Design By Humans’ commitment to the environment by using sweatshop-free blanks and eco-friendly inks. Design By Humans was started in 2007 with the simple vision of bringing artists from around the globe together to give them a platform to produce wearable art that tells a story, strengthens humanity and inspires life through creativity and design. The DBH Collective initiative is inspiring amazing artists and giving them a unique foundation to share artwork through a personal online storefront. If you’d like more information about this topic, please call +855 333 9836 x 302 or email press(at)designbyhumans(dot)com.